Maple Ridge has moved up six spots into the Top 10 in BC Business magazine’s annual ranking of “Best Cities for Work in BC”. This move up was attributed to a variety of factors including higher average household incomes ($107,319) and average household income under 35 years old ($89,552), strong five year income growth (17.1%), higher recreational spending ($5,275), a low unemployment rate (4.5%) and a strong local housing market (72.5 housing starts per 100 residents) in 2018. Read the BC Business article here. The fifth installment of the Pool Talk Update video series for the Maple Ridge Leisure Centre pool renovation is now available. This update addresses the recent adjustments to the project timeline. If you have questions or feedback regarding the renovation, comment on Facebook or send us an email. Your questions may even be featured in a future Pool Talk Update! You can also visit the City website for more information. 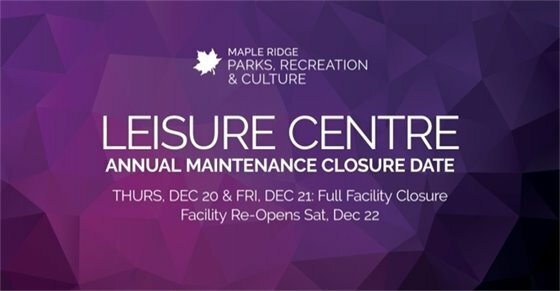 The fitness centre, gymnasium and all the multi-purpose spaces in the Leisure Centre will be closed Thursday, December 20 and Friday, December 21 for a top to bottom deep cleaning. In addition, several new pieces of strength and cardio equipment will be installed to replace existing equipment that has reached end of life. This includes four treadmills, a preacher curl, a seated leg curl and a back extension machine. The Aquatics Swim Lesson Survey is now available for customers to provide feedback on swim lesson programming for preschool and school age lessons. This survey will be open until January 15, 2019. A second survey is planned for late winter with a focus on aquatic recreation and fitness program offerings. This information will provide greater understanding of what the City can do to better serve our community and their aquatics needs when the Leisure Centre reopens in late summer. 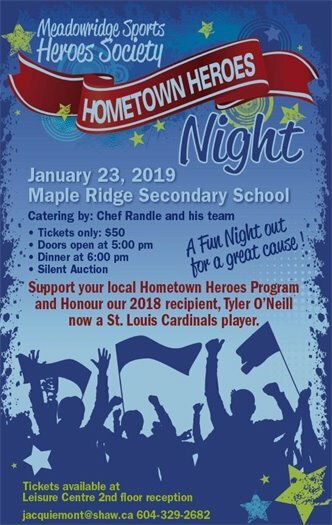 On January 23, 2019, local athlete Tyler O’Neill will be honoured as the newest Maple Ridge Hometown Hero. Tyler grew up in Maple Ridge playing baseball for the Ridge Meadows Minor Baseball Association and transitioned to the AAA Langley Blaze for the later half of his high school days. During high school, Tyler was also a member of the Canadian Junior National Baseball Team and was later drafted in the 3rd round by the Seattle Mariners in 2013. He now plays for the St. Louis Cardinals. Join the Meadowridge Sports Heroes Society on January 23, 2019 to celebrate our newest Hometown Hero and support our local Hometown Heroes Program. Tickets are now available for purchase at the Leisure Centre. In the spirit of the season, consider planning a snow angel block party to make your neighbourhood safer for you and your neighbours. The winter version of a block party includes snow/ice, shovels, lights, hot chocolate, warm mittens and a dash of good cheer! Apply for a grant today and help seniors and those with mobility/physical issues on your block to clear and salt sidewalks and driveways. For more details visit the City’s website or call us at 604-467-7325 ext 1. On November 30 – December 2, The Youth Leadership team headed to Loon Lake for 3 days of cabin adventures and outdoor experiences. The event was a huge success with over 20 participants. The purpose of this experience is to provide youth volunteers with increased leadership skills through facilitated workshops, plan for the year ahead and to celebrate the many hours of volunteerism contributed in 2018. 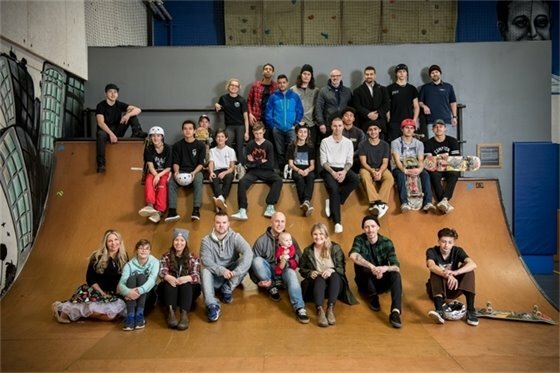 On December 16, Greg Moore Youth Centre hosted its 10th annual Shred, Share, Stoked skateboard competition and fundraiser. The successful event received large amounts of food and money donations that will go to help families in need this Christmas. The event was attended by members of Council, community partners and parents. A special thanks goes out to Oliver Rathonyi-Reusz from InView Images and all the sponsors. All participants went home stoked with donated prizes valued at over $1,000. Watch the completion video available on Facebook and stay tuned for more pictures of the event. 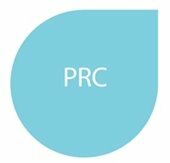 On Tuesday December 17, PRC Youth staff hosted the annual Christmas Cheer dinner at the Greg Moore Youth Centre. In partnership with Pacific Legal Education Association (PLEA), our local youth and staff planned for weeks to prepare, cook and serve a delicious turkey dinner for youth and families. A wonderful time was had by all 77 attendants who enjoyed the banquet style event and went home with full stomachs, leftovers and gift bags. The Parks Department has recently completed the fall tree planting program that included the installation of 33 trees. During planting, the trees are staked for initial stability and trunk protectors are installed at the base to protect from weed eater damage. In light of the natural gas shortage in BC, the City of Maple Ridge its doing its part to help conserve energy by lowering thermostats at all municipal buildings. 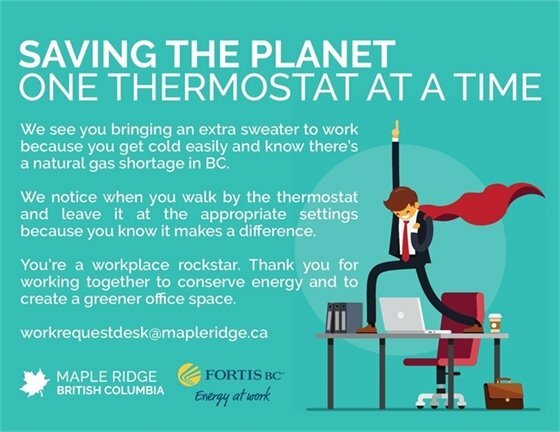 The City posted information cards on every thermostat to encourage staff to help make a difference in our community and to be “Workplace Rockstars”. Council is committed to conducting business in a manner that permits public participation at every opportunity. The public is invited to sit in on any of the following meetings of Council. Dates of meetings for 2019 are listed on the 2019 Meeting Schedule and the 2019 Council Yearly Meeting Calendar. Council meetings are broadcast via live streaming. For new users, we suggest that you go online before the meeting and test out the existing collection of videos to ensure that the streaming service works for you. Council meetings are broadcast on Shaw TV cable 4 at 2:00 pm on the Saturday following the Council meetings and rebroadcast on the following Monday at 7:00 pm. Copyright. City of Maple Ridge. All Rights Reserved.